I had the amazing privilege to visit the great city of Chicago for the Policy Link Equity Summit. The summit was dedicated to planners, activists and social justice advocates to provide us with the foundation needed to lead the resistance. I came back so refreshed and ready to tackle on the heavy challenges of securing affordable housing for all + working for a more equitable world. But of course- I had to see the city!! I stumbled upon this piece by Sam Kirk in downtown. I loved it instantly as it was tucked away in an alleyway, slightly hidden from view. We visited the Museum of Contemporary Art, and grabbed drinks at its famous + hip restaurant Marisol's. The cocktail bar was extensive and we got some bubbly to celebrate life + friendship. Marisol's has an inviting atmosphere, perfect for a quick drink but great enough for a full sit-down dinner. The best part about it is the restaurant is open to the public and not just museum goers! Seen at: Museum of Contemporary Art, Chicago. Howardena Pindell's What Remains to be Seen was a must see exhibition. The Black feminist visionary and activist is truly a beacon of our time as she has produced various works highlighting racism in pop culture + continues to inspire young emerging artists through her work. The exhibition spans the New York–based artist’s five-decades-long career, featuring early figurative paintings, pure abstraction and conceptual works, and personal and political art that emerged in the aftermath of a life-threatening car accident in 1979. The exhibition traces themes and visual experiments that run throughout Pindell’s work up to the present. We hit up Al's beef after a recommendation from a local admittedly while kind of drunk so our expectations were minimal at the most! Next thing you know we were counting our lucky stars because Al's Beef is nothing to play with! The great Chicago sandwich was actually formed out of necessity during the Great Depression when meat was scarce. In order to make the most of what they had, founders Chris and Al would slice the meat very thin and place it on thick loaves of fresh made Italian bread. The original recipe, which is still used in all Al’s Beef locations today, was developed in Al’s home kitchen. The family sold the delicious sandwiches at a neighborhood food stand and delivered them to local businesses until they opened their current location on West Taylor Street in Chicago. Today, Al's Beef is a Chicago staple, with locations all of the city and state with extensions in Nevada and California. One glaring factor in Chicago is its extreme residential segregation. Not to say that Boston and other major American cities aren't seeing similar patterns- due to a history of redlining and government policies- but Chicago lingers as its urban violence and constant headlines remind us of the ills of a separated and divided city. As soon as we left the downtown center, the aesthetics of the urban city changed dramatically. Skyscrapers were quickly replaced by blighted buildings and liquor stores. The neighborhood was primarily Mexican-American, and I was really blown away by the displays of street art in particular this piece depicting Native American Indians. It's a good reminder of the land we were standing on which was once occupied by the Patawatomi, Miami and Illinois tribes. Now you know I'm not going to come to Chicago and not have a deep dish pizza!!! Gino’s East Chicago-style deep dish is made the same way it was 50 years ago. We had their DEEP A*F pizza and lord- we were not ready!!! I tapped out after one slice! Keep in mind one slice feels like three! The concept of the restaurant is also very cool with a gritty, underground vibe. Walls are filled with tags and signatures from past visitors and a wall dedicated to the famous faces that have came by to try their food. Definitely a must-visit when in Chicago! 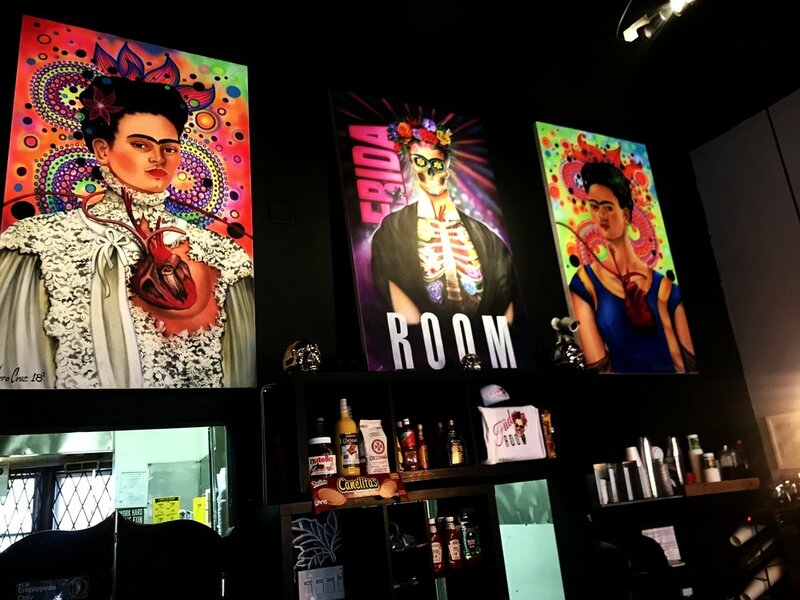 While exploring, we stopped at Frida's Room. The brunch eatery is perfect for a sunny weekend morning, and the staff were so accommodating and kind! I highly recommend this neighborhood gem tucked away in Pilsen. The Mexican-American menu is reasonably priced and healthy. House, Land Work. For all. 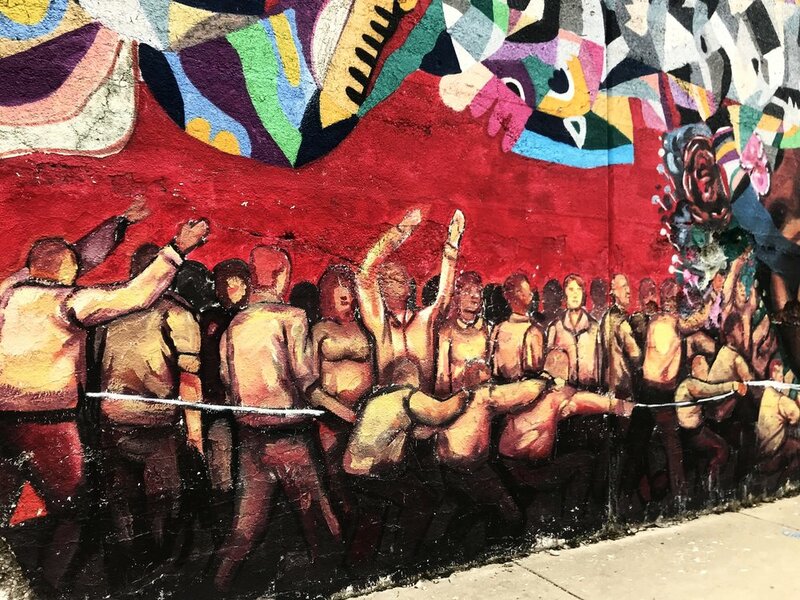 Coming across this piece in the Pilsen neighborhood reminded me once again why I chose urban planning as my career focus. All around us are reminders of the large inequality in our country. It's necessary to understand our history + what led us here so we can rectify the wrongs, and push forward. This street art provides a powerful impression of labor, the American dream + and its reality, and the constant fight for justice. A highlight of my stay was visiting the Chicago Theatre to catch Frederick Douglass Now- the one-man monologue play viewing contemporary America through the eyes of the famous Black revolutionary. The Chicago Theatre is an iconic structure of Chicago. To honor our conference, the night of our event the slogan of our convent displayed: Our Power. Our Future. Our Nation. As if I wasn't already mighty impressed with the food selection in Chicago, our friends suggested Sushi-San for a group dinner. The atmosphere was super dope with 90's hip hop ringing from all corners of the restaurant. We dined family-style and one of the standout favorites was the Beef'n'Bop. Filled with scallions and a soft-egg on top, this bowl was full of delicious beef and flavor! A must-try.